With growing responsibilities at home I’ve had little time for long format posts this year (catch me on Twitter & Posterous), much less travel abroad, and yet this has been one of the best food years in recent memory. If I was to sum what I learned in 2011: 1) the restaurant world got flatter and 2) US is quickly becoming a fascinating place to eat. Great restaurants didn’t just magically appear this year, in fact some have been open for some time, nor are they on every street corner in America, but restaurants run by the most committed chefs seem to be getting better. 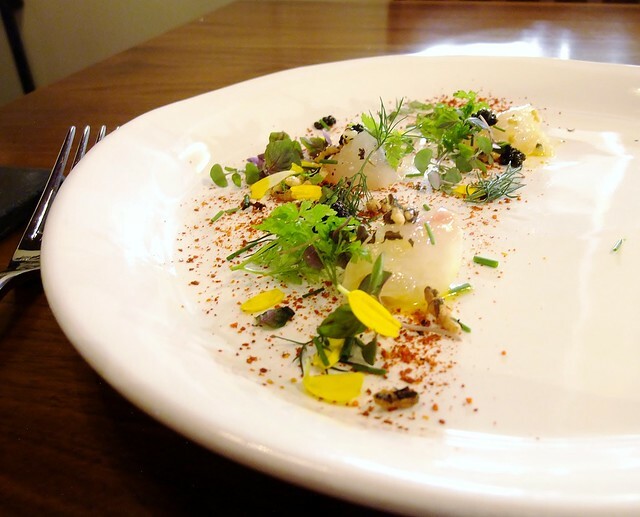 More than ever before restaurants around the US are emerging as serious dining destinations. There are at least three – Town House, Manresa and Saison – that give me the rare high you experience when you encounter exceptional cooking at the best restaurants in the world. This will come across as overly simplistic (or entirely too obvious? ), but technology is the reason why eating today is so much more fun than 10 years ago. Internet usability in the last 5-6 years has finally reached the point where its now much easier for serious eaters to find the sort of meals that used to occur only once or twice in a lifetime. But technology has opened up the world to chefs just as much as diners. Cooks in the most remote corners of the country now explore their ambitions past their geographical confines and their peer group often spans the length of the world. If you pay attention, you’ll notice great restaurants emerging all across America. If this trajectory continues, within 5 years most people will live within 4-5 hour drive of a chef doing really special work. Early indication this may be true – my best of 2011 list shows a growing number of dishes from Houston (although few were cooked in actual restaurants). Even more telling, the map of restaurants I’d love to visit is beginning to show more places in flyover country, while major cities (namely NYC) lag behind. In other words, 2011 is just a hint of what’s yet to come if you eat in US. Since my first meal at Saison at the beginning of 2011 I’ve watched Josh Skenes relentlessly raise standards. The food was already beginning to show great promise, but then something clicked and it surged into becoming one of the best restaurants anywhere. Like Carlo Mirarchi of Roberta’s, Skenes is currently exploring the depths of flavor by aging proteins and alternately using smoke, fire and curing applications – in fact not only with fowl, but tuna and beef. The results can be quite stunning. This wild duck was hung for 3 weeks and served rare with a minimalist backdrop of sweet, tart and salty. The effect was ethereal – amplified essence of duck, meat texture resembling a rare veal liver (I consider this a good thing) and what Skenes described as the best persimmon he’s ever tasted. I’ll go a step further and say this was one of the best dishes I’ve ever had. This was the second time Josh Skenes prepared his carefully aged pigeons for me and they were spectacular. It’s both entertaining and unnerving to watch the cooks pass the birds around the kitchen, smelling and poking with each turn. You get the full funk of decomposition when the pigeons are in the roasting pan, and everything you know about food tells you that you’re smelling spoiled food. And yet it’s not. The flavor is deep, complex, pronounced, like eating a well developed cheese. While others prefer the funk and complexity of birds aged longer, I like them a bit younger. The one aged 18 days still had a lush texture, but already had pronounced notes of cherry and chocolate that make these birds so special. Show stopping dish – bluefin tuna with fat and sinew lightly roasted and smoked over the embers (process which takes several days), shallots, and heirloom onions, served with a shot of tuna bone “marrow” and a nori dusted crisp. Gold leaf adds largely unnecessary bling, if you’re into that sort of thing. The intense focus on ingredients at Saison approaches only two other restaurants I’ve visited in the US: Urasawa and Manresa. There are few restaurants I’d rather eat. You know a restaurant is special when by the 4th course you begin to plan the route of your return. Five months after I visited Town House for the first time this year, I was back – this time with Justin Yu. We concluded that Town House should be viewed every bit as destination worthy as Noma. It really is that good. Where Saison is focused on isolating the singular depths of flavor in exceptional ingredients, John Shields is a master of composition. His dishes are complex, layered and highly nuanced, in the end coming together as a whole that’s much greater than the sum of its parts. Saison and Town House vaulted to the top of my list of great restaurants in the US, but Manresa remains my favorite for one reason: I feel really good there and never tire of the food. The cooking continues to evolve and get better (press finally caught on), and even after numerous visits I look forward to returning every time. Here’s why you should be glad David Kinch will continue to age his fowl just long enough to highlight natural flavors without compromising texture (long after every extreme aging of proteins becomes a wildly overused technique in lesser restaurants): his salt baked pigeon is as spectacular as it is at Saison. They taste completely different and I am glad to have the opportunity to eat both. I missed Jeremy Fox at Ubuntu, so I jumped at the opportunity when I realized he was cooking at Saison while I happened to be in town. It turned out to be one of the best meals of the year. Update: apparently this was more of a collaboration dinner between Fox and Skenes than a solo effort, which officially makes me a Saison fanboi. You rarely come a dish so well composed without it becoming muddled – pristine fish and textures at play, accented with slightly bitter, floral and grassy notes. 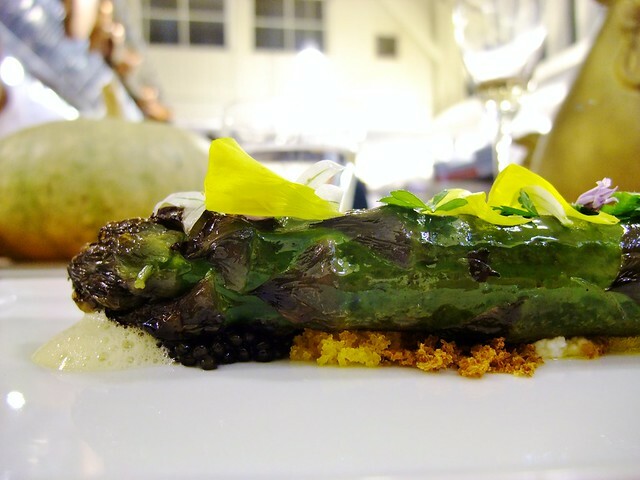 Another great dish that featured a giant asparagus stalk with big, bold flavor. Bread crumbs provided texture and really put this dish over the top. It’s incredibly exciting to see a young, talented chef return to Houston after working his way through some of the best kitchens in the world. 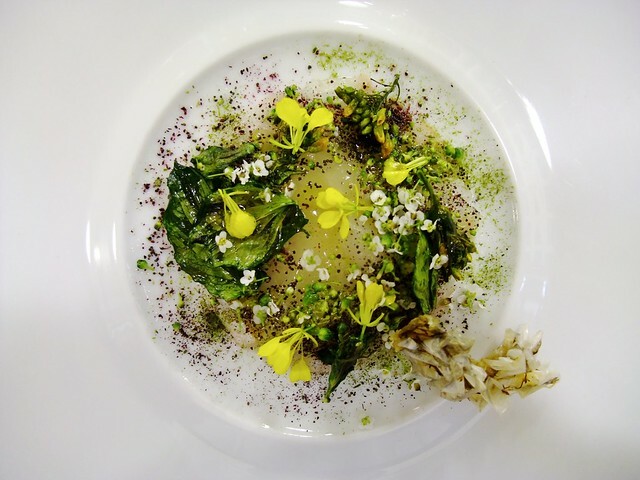 Justin Yu spent time at Ubuntu under Jeremy Fox gaining his deep appreciation for vegetables, then staged at In De Wulf, AOC and Geranium, making sure to eat through the best restaurants in Paris, Belgium, Denmark and England in the process. When Justin left Houston a few years ago his plan was to return to open the sort of honest Italian restaurant embodied by Flour + Water in San Francisco. When he came back, he was taken by Relae and Commis, both casual and yet gastronomically ambitious. This year Justin he will open Oxheart in Houston, which will take a look at the Gulf Coast region through a new naturals lens (for lack of a better term). Based on the dishes I had from him in 2010 and 2011, it will be one of the most important openings in the Southwest region in years. This dinner, intended to reflect his influences from Scandinavia, was one of the best overall dining experiences I had this year. This entire dinner was incredibly strong and along with my meals at Saison, Townhouse and Manresa worked as a end-to-end experience as well as on the strength of individual dishes. The restaurant at the remote Royal Mail Hotel in Dunkeld, Australia has tormented me for years as the destination I desperately wanted to visit. If not for David Kinch and his efforts to expose emerging global talent to US audiences through special dinners at Manresa (Redzepi was featured in the past) I might not have had the chance for some time to come. The tremendous dishes I had from Dan Hunter has the opposite effect than one I wanted to achieve – I now want to visit Royal Mail even more than before. Few chefs have the natural ability to match wildly diverse flavors with as much ease as Randy Rucker (Richman happens to be a fan). The result can be a wild ride – dishes are created on the fly in rapid succession, never to re-appear again, creating the sort of dining cadence that makes you think of a kitchen as a jam band, where anything can happen on any given nights. With every visit, the cooking, while not always as even (or predictable? sterile?) as in kitchens that polish their menus for months, always has extreme highs that more than offsets any rough spots. Then there are times when everything just works. Bootsie’s is now closed, but Rucker should be back with a new restaurant in Houston’s museum district in 2012. One of many stupid mistakes I made this year was missing the heritage grain dinner held at McCrady’s in October, despite being in Charleston (at least I was at Husk) the night it was held. The few dishes from this dinner I had the following night at McCrady’s were my runaway favorites of the night. The flavors in this rarely seen preparation of Carolina rice called Charleston Ice Cream were simple and pure – rice, butter, flowers. The work Sean Brock is doing with Southern ingredients, especially grains, is nothing short of visionary – one of many reasons Charleston will continue to be a serious dining destination for years to come. Seth Siegel-Gardner (another talented chef who recently returned to Houston after working at Gordon Ramsay, Aquavit, Fat Duck and Viajante) had a highly successful run at Kata Robata this year where omakase dinners at the sushi bar turned into an exciting “restaurant within a restaurant” serving some of the best food in the city. Since then, he has teamed up with Terrence Gallivan (most recently an executive chef at Alta in NYC) to form Pilot Light Restaurant Group, expected to open a yet unnamed restaurant in 2012. This dish from one of their dinners at the Revival Market, built around an earthy hen of the woods mushroom and rich egg emulsion, is one of my favorites of the year. For the last few months of 2011 this Southeast Asian learning pop-up brunch by Justin Yu and several co-conspirators gradually became one of my favorite food experiences of the year. It’s hard to say whether it’s the imaginative neo-Asian cooking (oddly missing in Houston), amazing donuts & coffee, or the offbeat Chinatown location that made Moneycat so successful, but by the end of the line the non-existent restaurant was stacking up press accolades and regularly running out of food. Nasturtium seemed to be everywhere in 2011. This preparation at Saison was the most interesting. The leaf is buttered and pressed flat and cooked until crisp. The effect is visually striking and provided great texture offset to this dish. I asked David Kinch if he was referencing soba with this dish. He paused for a second and said “no, I just wanted to make a cold noodle dish”. See how that works? Chicago dining tends to be predictably “molecular”, but this exploration of summer corn flavors and textures at Phillip Foss’ unfortunately named El has the sort of ingredient focus that makes me excited to return in the future. As much as I love Saison, I find their efforts to add more luxury ingredients, such as truffles and golf leaf, to be a distraction. Then again, I can’t deny being completely taken by this simple presentation of lightly smoked caviar and chicken gelée. Few people consider caviar “comfort food”, but I immediately think back to the day my father walked in on a snowy Moscow day with a kilo of contraband caviar, direct from the processing plant. Growing up in USSR had it’s surreal moments. You often hunted multiple stores for milk and eggs; bananas were rare and prized treats. Yet caviar, while not exactly easily obtained, somehow felt much more ordinary than a mango. Another dish from Manresa? Yes. Ice milk, coffee with just pressed olive oil – presented as an amuse, rather than a desert course, was as simple as it was stunning. 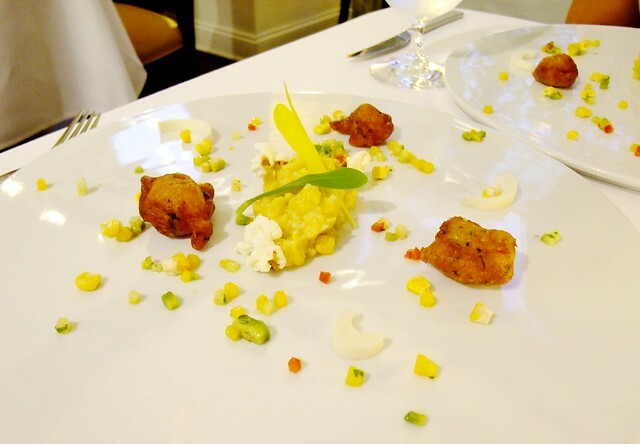 Dishes like this make the trip to Los Gatos a must for anyone serious about food. I don’t remember the specifics of this dish at Bootsie’s, but I do remember it bursting with vegetal flavors and lush textures. Grant Gordon is another talented young chef emerging in Houston, taking on the challenge of returning a Tony’s – a dinosaur of a restaurant (think Le Cirque) – to greatness. So far he’s succeeding brilliantly. 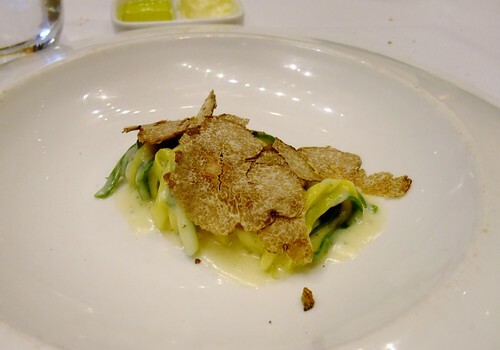 The night my companion and I ordered every option available on the tasting menu, minus the $125 Straw and Hay, White Alba Truffles, the dish showed up at the table anyway courtesy of the restaurant. This and other pasta courses put Tony’s in contention with Quince and Vetri for some of the best pasta in the country. Sushi in the mid-range in NYC is still far better than what you can get outside standard setters like Urasawa. My standby in 2011 has been Ushiwakamaru, but my single visit to Sushi Azabu makes me wonder if I’ll have a new favorite in 2012. This Red Sea Uni was unlike any I’ve had – exceptional sea urchin with an unusual cherry finish. I’d be back just for this bite alone. These smoked chicken wings are one of many reasons why I continue to think Husk in Charleston is one of the best casual restaurants anywhere. 4505 Meats stand at the Ferry Market in San Francisco. Best burger just about anywhere. Ashby Inn in Paris (no, not that Paris) Virginia stays off the radar for more people who travel for food, but it’s worth a visit. Tarver King’s cooking is closer to Cyrus than Manresa, but it’s it has one huge benefit – it’s on the way from DC to Chilhowie. Another stop on the DC t0 Chilhowie trail – the flavors at Thai Siam located in the middle of nowhere in Virginia might be a notch above Lotus of Siam. I was three hours away from this place a few months ago and I seriously considered driving out just to get my hands on more of this chili dip. Can’t promise that I’ll post with any more frequency this year, but you can always find me on Twitter: @tastybits.